While most people were busy “only” with the holiday season, we had an additional reason to celebrate in that final week of December. My beloved’s Birthday. 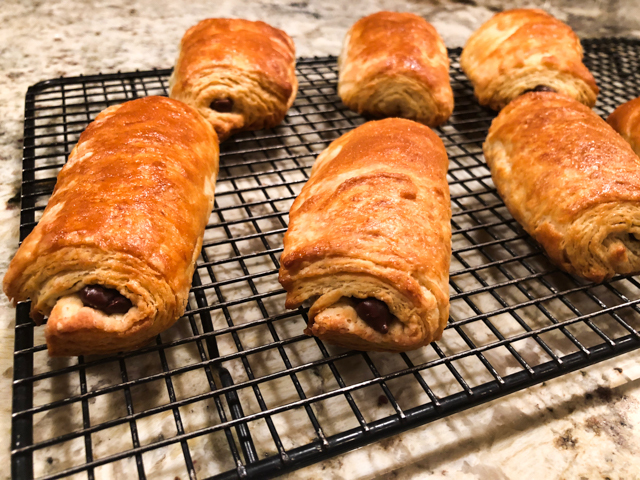 To start the day on the right note, I decided to bake a batch of one of his all time favorite treats: Pain au Chocolat! Whenever we go to Paris and sit down for our first coffee next morning, it never fails, he always asks for it. 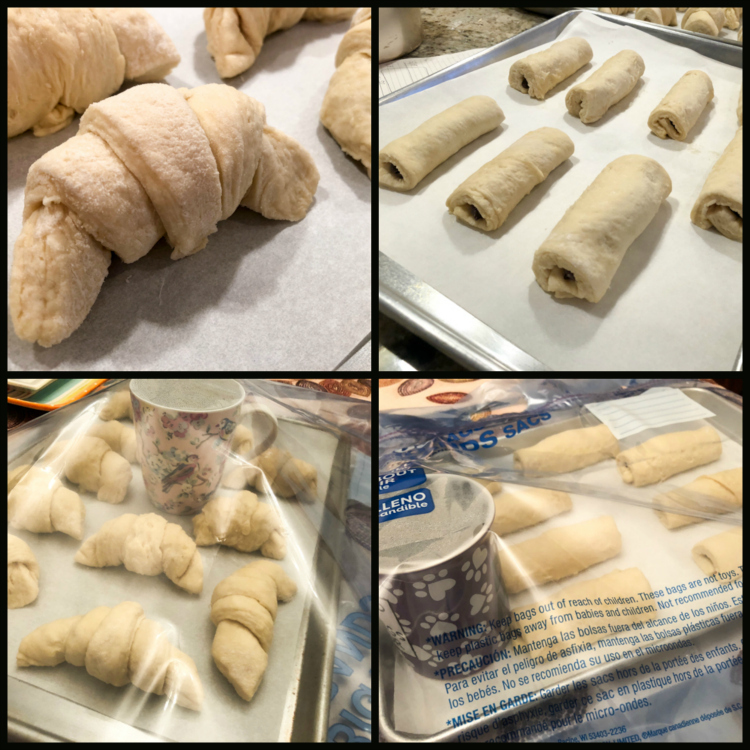 The plain croissant can wait… but, since they take the exact same dough, I said to myself why not make both? And that’s how a little bit of Paris was brought into a chilly Kansas morning. Make the butter block: In the mixer bowl fitted with the paddle attachment, cream the butter on speed 2 until it has softened and no longer clings to the paddle. Mix for about 1 minute. The butter should be smooth. Roll it to a 10 inch square, as perfect as you can make it (I rolled it inside a quart size ziplock bag). Put it in the refrigerator as you work on the dough. Make the dough: Put the eggs, yeast, water and dry milk powder in the mixer bowl. Fit the mixer with the dough hook attachment. Mix on speed 1 for 30 seconds to combine and dissolve the yeast. Add the flour, sugar, butter and salt. Mix on speed one for 4 minutes, until the dough reaches “clean-up” stage. Mix for 1 more minute on speed 1. Remove the dough from the mixer and knead by hand for a couple of minutes. Do not add any additional flour to the dough or to the work surface. Place the dough in a buttered bowl and let sit at room temperature for 30 minutes. After 10 minutes, remove the butter from the refrigerator. Leave it resting for about 20 minutes, as the dough rests. Check to make sure it is the correct temperature. The butter is the perfect temperature is when the butter packet can be rolled on the edge of the counter without cracking. Lightly flour your work surface and roll the dough out to a 10 inch by 20 inch rectangle. Place the butter block on the left side of the dough. There should be one inch border of clear dough on all three opened sides. Fold the unbuttered side over the buttered side of the dough. Press down on the unbuttered edges to seal them. Dust flour under the dough so that it does not stick. Lightly dust the top. Roll out the dough until it measures 12 by 24 inches. Place the dough on a parchment lined baking sheet and turn the dough so that the long fold is furthest away from you and the long open side is nearest you. The two open short sides are at your right and left. Each time you make a turn the dough should be positioned in the same way. Mark the turns on the paper, crossing off each turn as you complete them. Fold the dough in thirds (like a business letter) – always starting with the right side. Then fold the left side over the right. This is your first turn. Cover the dough with plastic wrap and refrigerate for 30 minutes. After 30 minutes, remove the dough from the refrigerator and complete another turn. Return the dough to the refrigerator for another 30 minutes and then do one more turn. You have now completed all three turns and the dough can be wrapped and refrigerated overnight, or you can proceed with the final rolling out. Roll the dough into a 26 by 17 inches rectangle. Cut in half lengthwise and straighten all the edges by trimming about 1/4 inch of the edges. 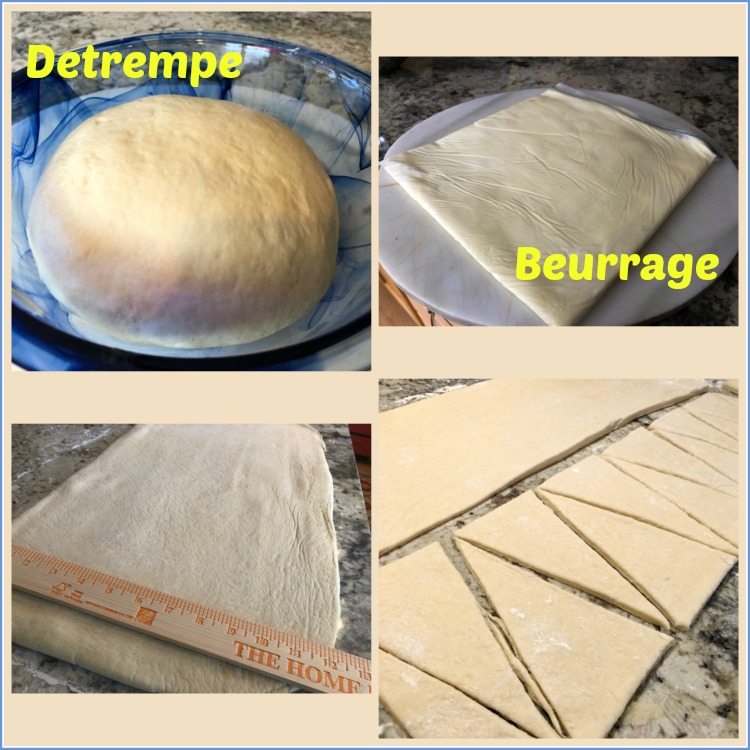 Cut the dough into triangles (base should be 4 inches, height should be 8 inches), or rectangles for pain au chocolat, as shown in my photo below. 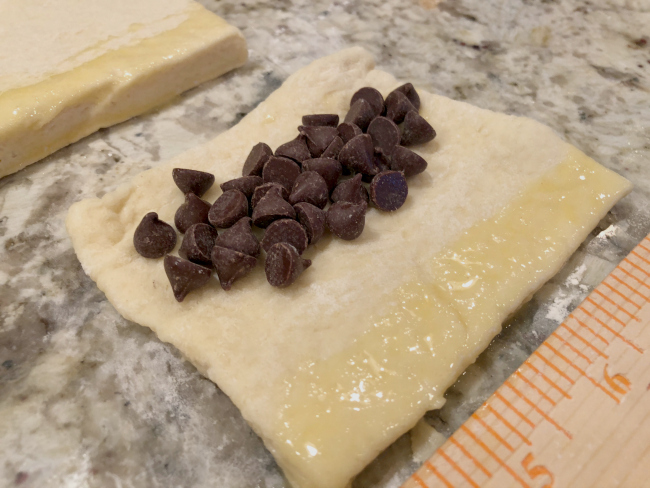 If making pain au chocolat, add a chocolate baton or sprinkle semi-sweet chocolate chips in the lower half of the dough. Brush with egg wash the farthest edge of the rectangle, then roll the dough around, making sure the egg wash part in tucked under. Proof the croissants and pain au chocolat inside a large baking sheet covered with a plastic bag – include a large mug with very hot water to generate steam and make a nice temperature for proofing. Check after 45 minutes, they should look a bit more plump. 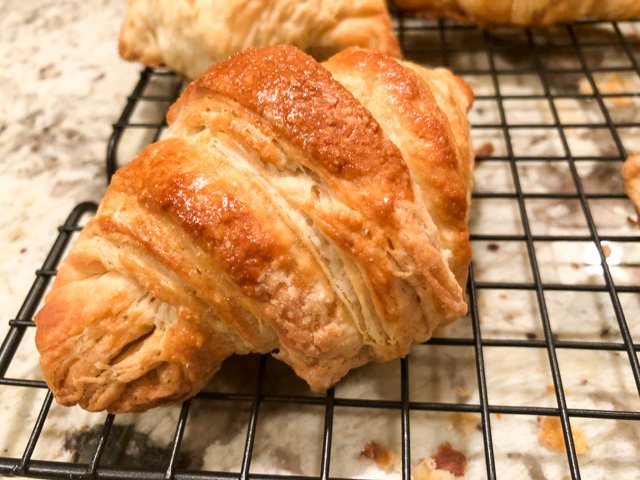 At that point, you can brush the surface of each little croissant and roll with egg wash.
Bake at 400 F for 15 minutes, then reduce the temperature to 350 F and bake for 15 minutes more. If they are not fully golden, bake for 7 to 8 minutes longer. Comments: Have I praised enough the online classes at Craftsy? My first experience was macarons, also taught by Colette. Love her. Then, I decided to get the Classic Croissants at Home class and I must say I learned so much, it’s not even funny. Worth every penny, particularly because I got the class on a special end of the year sale. Cannot beat that. Croissants and pain au chocolat are all about precision. See that yard stick? She advises getting one and using it at every stage of rolling and folding. It makes life so much easier! The recipe is detailed, but nothing compares to watching her make the dough and show you exactly what you are looking for. I highly recommend it. And she is very responsive, if you have doubts and asks her a question at the platform on the site, she usually will answer in a few minutes, or at most a couple of hours. Even during the holidays! 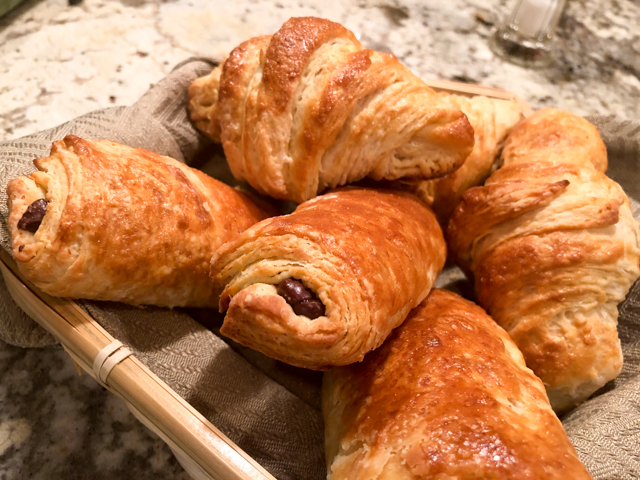 It is important to use either the batons sold specifically for pain au chocolat, or chocolate chips, because their formula prevents them from melting during baking. If you use regular chocolate, as you bite into it, you’ll be covered by a liquid lava. Yes, tasty, but not exactly the goal here. The proofing using a very large ziplock bag is pure genius. They sell those for storage of very large items and they work wonders to enclose a large baking sheet. The mug with hot water turns it into a home-made proofing device, moist and just warm enough for the dough to rise. I save two large bags for my baking, if any flour or egg wash glues to the inside, you can wash with warm water and dry them over the back of a chair. This was a very nice cooking project, perfect for a cold day. Of course it is a lot trickier to try and make laminated dough in the summer, so keep that in mind. One of the very few advantages of chilly weather. I would like to thank Colette for yet another superb class. Your attention to detail, and neatness during baking are really inspiring! The best thing of making a big batch of these goodies is that they freeze very well. So, when the mood strikes, we remove a couple from the bag and place them, still frozen, in a 350F oven. In less than 10 minutes you can have croissants that taste as good as freshly baked… What’s not to like? SIX YEARS AGO: My First Award! indeed! And that is one situation in which going all fancy on the chocolate back fires big time…. Perfection! I used to help my mother with croissant dough. Perhaps that’s why I have no thoughts of making it myself! Yours are perfection! No, not fun with my mother, but it was good experience! AMAZING!!!!!! You are AMAZING! They look perfect! You have one LUCKY husband! Those look divine! I’m going to have to sign up for her Craftsy class! How nice that she let you share her recipe! Beautiful. Would love to have eaten both the croissant and chocolate version. Wishing you the best year ever in 2018. I would come across this one (just getting caught up on my blog reading) when I have just started the metabolic diet. Clever you! I am impressed. Happy New Year.